Effective March 6th at 00:00 UTC, we are reducing trading fees for more than 99% of our customers (based on historical volume data) and streamlining — from 11 to 3 — our trading tiers. 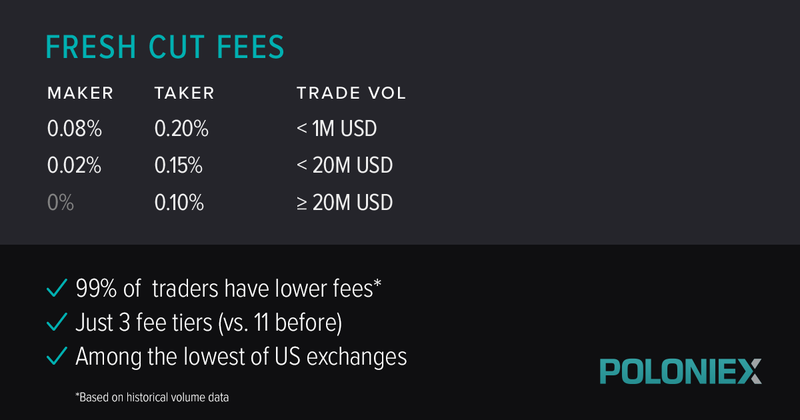 These changes make trading fees on Poloniex among the lowest of U.S. exchanges. You can see the new fees and trading-fee tiers here; they are subject to change monthly. Want to know what your tier is? You can find that here. These steps are part of our commitment to continuously improve customer experience and come on the heels of technical upgrades, asset listings, and new features that make Poloniex easy to use. We are also launching a new designated market maker program. If you have any questions about this program or our fee structure, please reach out to us here. As a reminder, you can sign up for Poloniex here — or, if you’re an institutional trader, here. Originally published at blog.circle.com on March 5, 2019.